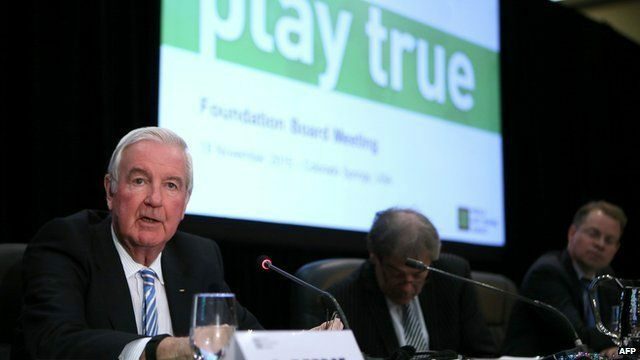 World Anti-Doping Agency (WADA) President Sir Craig Reedie has claimed he is confident the Russian Anti-Doping Agency (RUSADA) will have fulfilled the requirements laid out by the organization by the time of the next Foundation Board meeting in November. Sir Craig, who has presided over WADA during the entire Russian doping saga, told insidethegames here that he would be “disappointed” if RUSADA had not met the criteria when the 38-member ruling body convenes for its next gathering in Seoul on November 16. It raises the possibility that the Foundation Board may be in a position to vote on RUSADA’s re-compliance later this year. RUSADA were given hope here today when a report from WADA deputy director general Rob Koehler said they may be able to resume testing as early as the beginning of June. Koehler revealed RUSADA was on its way to completing four “immediate requirements” previously established as part of their path to regaining compliance. This includes ensuring there is an independent chairperson and installing a conflict of interest policy within the RUSADA Board. That box is likely to be ticked when Yelena Isinbayeva, the double Olympic pole vault champion and world record holder, is officially removed from her position as chairperson at a meeting on May 31. In an update presented to the WADA Foundation Board, Koehler confirmed these had been accepted by RUSADA, while another of the criteria regarding access to Athlete Biological Passport (ABP) samples has already been met. RUSADA is also in the process of opening up the “closed cities” to doping control officers, another regulation set out by WADA as the organization continues its bid to be declared re-compliant. “I would be very disappointed if we did not complete the whole agreed roadmap by November and I am very confident on the conditions that are available now being purified,” Sir Craig said. The seemingly rapid recovery in RUSADA’s efforts, which comes despite concerns being regularly raised both publicly and privately in recent months, may lead to some skepticism, but Sir Craig insisted they were “not being soft” on the scandal-hit nation. In December of last year, Canadian lawyer Richard McLaren produced evidence that more than 1,000 Russian athletes were allegedly implicated in a scheme where samples were tampered with and manipulated at events including the 2014 Winter Olympic and Paralympic Games in Sochi. The findings in the document, which sent shockwaves through the sporting world when it was published, led to calls for Russia to be banned entirely from next year’s Olympic Games in Pyeongchang. “I don’t want to be accused of being soft on Russia as I am not being soft on Russia at all,” the 76-year-old Scot added. “I have been saying to them this is the way the good people work and if you want to be part of the good world get it to work that way. “Of course there is still work to be done as there is an agreed roadmap but the two international experts we have will help them do that. Sir Craig also urged RUSADA, which has been non-compliant since November 2015 following the Independent Commission findings in November 2015, to appoint a director general sooner rather than later. Tatyana Chirkina was named as acting director general in March to fill the void before a permanent appointment is made. It follows the departure of former director general Anna Antseliovich, who left the role two months ago. The main task of the permanent replacement will be ensuring the “integrity, independence and objectivity” of RUSADA, as well as the “availability of capacity and resources for the protection of the fundamental right to participate in competitions of sportsmen of Russia and other countries, free from doping”. Sir Craig had claimed that “much work had been done” by RUSADA on the eve of the Foundation Board meeting. In his general update to the Board today, Koehler said the “necessary practical elements are in place for RUSADA to commence anti-doping work” and they had made a good deal of progress. However, he warned that work still needed to be done before they are welcomed back after a near two-year absence. Koehler revealed that 2,731 tests were issued in Russia by UK Anti-Doping 2016 and that 84 per cent of these – 2,300 – were collected. A total of 2,344 more tests originally planned were cancelled due to the lack of available doping control officers, however.